The latest official data from Apple reveals that 78 percent of active iPhone, iPad and iPod touch devices are running the company's latest mobile operating system, iOS 7, up four percentage points from earlier this month. Apple's figures cover the 7-day period ending Dec. 29, 2013. With iOS 7 covering the lion's share of Apple mobile devices, iOS 6 remains installed on 18 percent of users' handsets, while earlier versions of iOS account for 4 percent. 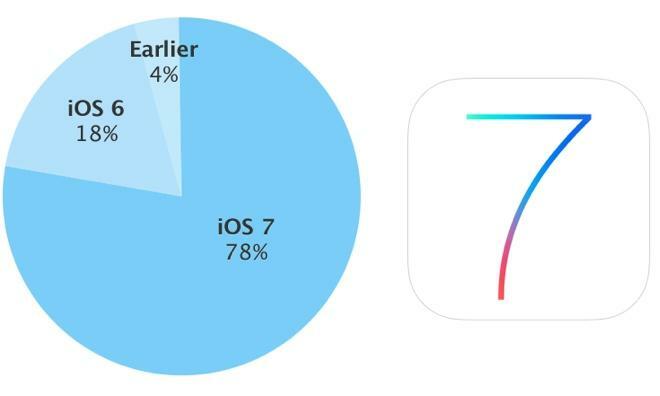 The gains made by iOS 7 over the last month came entirely at the hands of iOS 6, which fell from 22 percent at the start of December. Earlier iOS versions remained flat at 4 percent. The figures reaffirm users' quick adoption of Apple's latest software, as iOS 7 was only released to the public in mid September of this year. With iOS 6 just over a year old, that means that Apple's two most recent platform releases are installed on a whopping 96 percent of active iPhones, iPads and iPod touch units. In contrast, though Google has not updated its own official developer statistics since Dec. 2, its most recent data showed that just 1.1 percent of Android devices were running that mobile operating system's latest version, known as Android 4.4 "KitKat." The largest share of Android users are running some form of "Jelly Bean," which ranges from 4.1.x to 4.3. But a significant 24.1 percent of Android users are still running versions 2.3.3 to 2.3.7, also known as "Gingerbread"— an operating system version that was last updated in September of 2011.